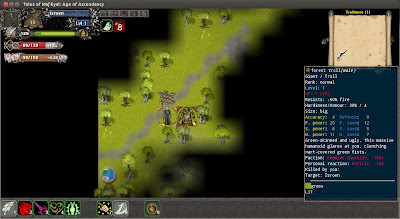 Tales of Maj’Eyal (ToME) is a free and open source roguelike RPG, featuring tactical turn-based combat and advanced character building. You can play as one of many unique races and classes in the lore-filled world of Eyal, exploring random dungeons, facing challenging battles, and developing characters with your own tailored mix of abilities and powers. With a modern graphical and customisable interface, intuitive mouse control, streamlined mechanics and deep, challenging combat, Tales of Maj’Eyal offers engaging roguelike gameplay. If you like role playing games with lots of content, classes, achievements, unlockables, a nice story and music, then ToME is highly recommended. Once you have completed single player campaign and unlocked extra classes and other goodies, you can play infinite dungeon mode for extra challenge, rare loot and for fighting rare monsters. The game is really fun and you will find it to be one of most user friendly roguelike games.